La-Pha-Pack offer the first 9mm Short Thread Cap with assembled aluminum liner. Septa material free of any elastomers and halogens; therefore no contamination of the sample by plasticizers, Silicone or Butyl rubbers and PTFE/FEP/TEF materials. 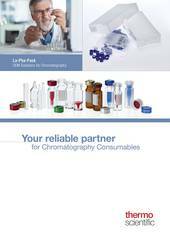 Recommended for GC/MS and LC/MS applications. The O-ring, which is assembled above the aluminum liner, achieves an excellent tightness and inertness of the complete combination seal. Analytic of elastomers und plastomers. Analytic of silicones und silicates. Analytic of fluorinated, halogenated organic compounds.